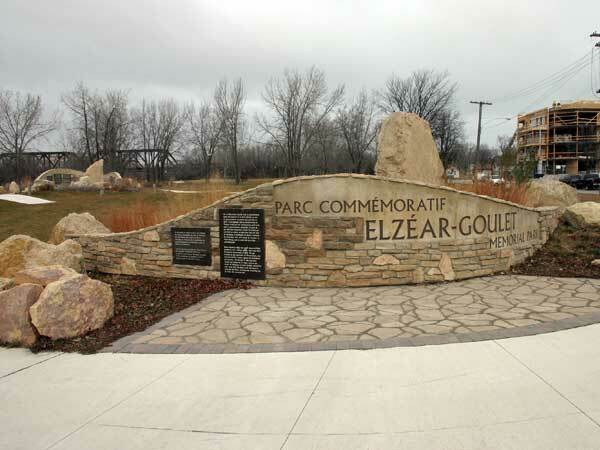 Elzéar Goulet Park is located in St. Boniface on the banks of the Red River on the west side of Tache Avenue at the foot of La Verendrye and Aubert streets. The park’s marker includes two plaques. One commemorates the donation of land by Susan Scott to the Assembly of Manitoba Chiefs for use as a park. The other explains the naming of the park to honour Métis leader Elzéar Goulet, who was drowned in the Red River by an angry mob.